Memphis Electronic Music & Arts Festival (“MEMFest”), just two years in the making now, has already had a massive impact on the Southeastern dance music community. While the festival’s first installment took place at the esteemed Levitt Shell with late night shows at Newby’s, MEMFest founders Nolan Leake and JodyLand found a new home for the event at the Water Tower Pavilion with late night shows just up the street at a club called Forge on Broad Avenue. With over 60 DJs from all over the U.S., and even as far as Italy, festival goers gathered in the Home of the Blues and Rock & Roll, the world renowned Memphis, Tennessee, for a weekend of dancing and friends. MEMFest brought in attendees from as far as Knoxville, Tennessee and New Orleans, Louisiana, and the proceeds benefited the Hardwood Center. The Hardwood Center is a non-profit organization that has provided support and education for Mid-South families and children from birth to age five who are affected by developmental disabilities since 1957. The Hardwood Center serves five counties in West Tennessee, and Harwood serves students with diagnoses such as autism spectrum disorders, Down syndrome, cerebral palsy, and many others from its Downtown Memphis location. MEMFest, including artists, staff, attendees and all others involved, proudly benefits the Hardwood Center, and they made it abundantly clear with loud cheers and roars of applause every time it was announced on the microphone. The festival offered as many as three DJs playing at any one time during the afternoon and early evening, followed by a single Main Stage for the headliners at night and two late night stages. Besides the Day Stage, run by local DJ Paradise, the “Not So Silent Disco” was running up to two DJs at once from 1:00 pm until 7:00 pm. The festival began with myself, Ragin’ Randy, on the Silent Disco stage and probably the youngest DJ on the lineup, Z-Dougie, on the Day Stage. While I didn’t get to hear Z-Dougie’s set, I could see that his fans were getting down. Meanwhile, I played a funky house set in the Silent Disco headphones as a small crowd began to shuffle in. Next, Eratixx and KwikFlip took over the Silent Disco stage. Eratixx played a fairly dark, melodic set with lots of swells and changes in the energy, while KwikFlip, from what I heard, played a primarily hip-hop based set. Meanwhile, Don Twan held his own on the Paradise Day Stage. Next up on the Silent Disco stage were Party Matrix, who played a very high-energy set, and Dr. Steam, who threw down a sharp drum & bass set. JuJu Beats tagged in on the Day Stage, after Don Twan, with a deeper style set, followed by some dynamic trap and dubstep from Defective Agency and a wild set from DJ Paradise that covered almost every end of the dance music spectrum. From then on, I was transfixed on the Main Stage. First up was local psychedelic rock/electronica band Agori Tribe. The talented young group played a tight, rocking set, even though most of the crowd was huddled together under the Silent Disco tent for most of their set due to some heavy rain. The rain didn’t stop the band rocking out, however, and by the end of their set, the rain backed off and the hoopers came out. Medusa, from St. Louis, Missouri, came out next and slammed some trap and dubstep beats down our throats as the night crept in and the light show began to stand out. JodyLand Entertainment and Crop Circle Productions spared no expense for this event, and the DJs and crowd let them know it every chance they had, giving constant shout-outs and cheers to the Memphis-based production companies. Spankalicious, from Columbia, Missouri, came up after Medusa, staying true to his style with a very percussive set that kept the crowd on their toes. I got a chance to speak with Spankalicious before his set, and he has some big things in the works at his new label Thaz Dope Records. Stay tuned for my full interview, coming soon. Archnemesis followed up Spankalicious with a beautifully sculpted set of tunes, keeping the crowd constantly dancing, as always, with his undeniably unique take on bass music. Rounding off the Main Stage for Day 1 was Italian DJ and producer Bass Science, who kept the high-energy groove in full force and the crowd buzzing for the Late Night events. After the Main Stage wound down, it was time for the Late Night events. First up in the Main Room was a monster collaboration between local DJ and MEMFest founder Gutta Kick (Nolan Leake) and Memphis rap sensation Al Kapone. After some raucous head banging, I headed upstairs to catch the end of another JuJu Beats set with a little more umph to it than his earlier deep set, followed by the newest Memphis bass music sensation TN Bass Massacre. The duo, one a Memphis native and the other hailing from Tampa, Florida, have been making music together a mere 8 months and have already developed a devoted following. I caught up with the boys earlier on in the day to talk about their newfound chemistry, so stay tuned for my full interview coming soon. Taking the Upstairs Room by storm, TN Bass Massacre proceeded to tear down the roof of the Forge, and that is where my night ended. Although the afternoon and early evening were plagued by rain, it turned into a beautiful night, and Day 1 was still a huge success. With the sun shining and all inklings of rain left in the past, Day 2 kicked off with a stellar lineup of Memphis artists. While psychedelic dub artist Mixed Medium took the reins on the Paradise Day Stage, Eratixx took another turn on the Silent Disco stage alongside Grac3land. Again, switching between the Day Stage and the two channels of the Silent Disco, it was tough to hear everything, but Eratixx seemed to play a similar set to his Day 1 set, exploring some darker sounds. Grac3land played a heavier set of primarily dubstep, while Mixed Medium laid down some spacey, psydub beats. Peace & Love took over on the Silent Disco stage, playing an ear-opening set of completely original minimalistic bass music. The duo was joined later on the Silent Disco stage by Gutta Chick for a hard-hitting set of trap, dubstep and hip hop. Meanwhile, reK speKs followed Mixed Medium on the Day Stage with some more trap and dubstep, keeping the energy high and the crowd engaged. DJ Wook came up on the Silent Disco stage with a funky set of disco house music that kept headphone-wearing attendees moving and grooving, followed by a massive combo of Knoxville duo Kandi Jungle and the local Strange Wayne. The Silent Disco stage was put on hold for me for a while, as I became completely enrapt in an incredible lineup on the Paradise Day Stage. Alex Epps played a dark, deep set of all original tracks that had crowd and staff alike mesmerized. As I set up behind him looking out toward the street, I couldn’t help but think that Broad Avenue must be shaking. One of the other DJs sitting next to me described it as “forest music.” Alex took a few minutes to sit down with me after his set, so stay tuned for my full interview coming soon. Next, DJ Irie spun an incredible funky, deep and tribal house set that had all of us grooving and getting down, including a nice Daft Punk section. Skinny B took over with an incredible exhibition on the art of DJing. 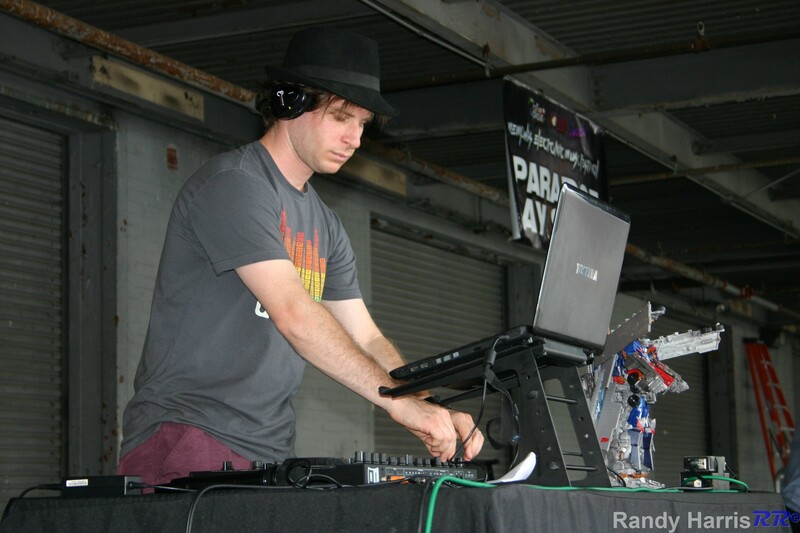 Fitting in almost 100 transitions in a one-hour set, the veteran DJ ran through a host of hip hop, dubstep, trap and pop tunes and remixes, taking the Paradise Day Stage to a new level. Meanwhile, as The Chinese Connection Dub Embassy (“CCDE”) was starting up the Main Stage, I got my second set rolling on the Silent Disco stage. This time, I went a different approach, starting off with deep house and working my way into some deep, melodic trance for the second half of the set. While I had some trouble hearing next to the full band on the Main Stage, I could see the Silent Discoers grooving hypnotically to my first attempt at DJing trance in a live setting. While I didn’t get to hear CCDE’s set, they always put on a good show, and I have no reason to suspect that this one was any different. Following CCDE, Memphis’ Gutta Chick took to the Main Stage to keep up the electric energy in the air and made sure the crowd stayed warm and on their feet. All the way from Pittsburgh, Pennsylvania, Headphone Activist stepped up next, throwing down a very melodic set. Starting off slow, he gradually built his set up and ended up with a slew of originals that left the crowd buzzing. I spoke with Headphone Activist after his set about his unique musical background and approach to making music, so stay tuned for my full interview coming soon. Knoxville, Tennessee’s premier electronica band followed with a dynamic, entirely instrumental set, switching back and forth between synthesizers and guitars. Finally, to round off the Main Stage, Cyberoptics raged out an in-your-face dubstep set that had heads banging and feet moving non-stop. Onward to the Late Night stages at Forge one last time, Gill-Yum started in on the Upstairs Room, beginning very slow and chill before working his way up into a growling psydub set. Meanwhile, Eno aka Confusion rocked out a massive electro set in the Main Room. After a short break, I returned into the Main Room to hear Lurple D throwing down some raging electro dub, while festival ragers spun glowsticks and hula hoops. Finally, I ended my MEMFest with the beginning of Moniker’s rocking Main Room set, leaving the late night ragers dancing hard. Overall, MEMFest was an overwhelming success. All of the artists gave their all and had a blast. Most of the artists who came from out of town told me that their favorite part of MEMFest was the people in Memphis, not just the fans and attendees, but the artists and festival staff as well. Headphone Activist, from Pittsburgh, told me that it felt just like going out to play at home. The best part for me was witnessing this event taking place in the heart of Memphis. Memphis has needed an event like this for quite some time, and the first two installments of MEMFest turned out incredible. Besides an unbelievable cast of musicians, JodyLand Entertainment and Crop Circle Productions brought out fire dancers and an amazing light set up, and they even had a professional welder come out and give us a show by throwing sparks into the air to a recorded dubstep set. On top of all that, the festival represents the always growing heart of Memphis by bringing people together to benefit the incredible institution that is the Hardwood Center. Here’s to many more years of MEMFest to come.